I come from a long line of coffee lovers. One of my fondest childhood memories is waking up in my grandmother’s little apartment, hearing her percolator happily perking away and smelling the delicious aroma of coffee wafting through the air. While I have decreased my caffeine consumption considerably, I still do love my morning coffee. So I was happy to find the Muddy Dog Roasting Company at the Western Wake Farmer’s Market! Muddy Dog Roasting Company is based in Morrisville, NC, and the small company is dedicated to providing environmentally and socially responsible coffees that are sourced green and roasted in small batches several times a week. This means the coffee is incredibly fresh, sometimes roasted just a day or so before it reaches your kitchen. By purchasing green coffee beans directly from the farm or estate, Muddy Dog develops relationships with growers and they have a high level of knowledge about the growing practices of the farms they purchase from. Muddy Dog does buy certified coffees (certified organic, fair trade, etc.) when feasible, but primarily they buy beans from growers who practice organic and fair trade farming, even if they are not certified. I have learned a lot from Muddy Dog about the complexity and expense of becoming “certified”. For many growers, even if they practice organic or fair trade standards, becoming certified is not financially advantageous. 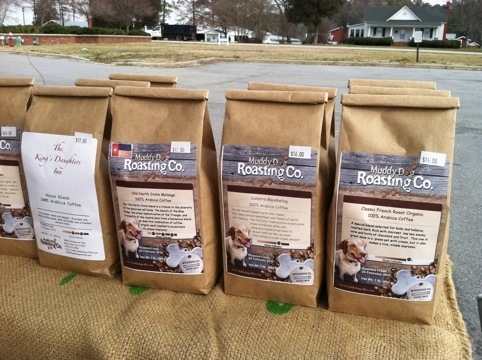 Muddy Dog Roasting Company roasts their beans in small batches using an environmentally “green” roaster. This roaster may not look all quaint and old school, but unlike older roasters it uses less power and emits almost no measurable emissions. Personally, I like that. Thanks for the shout-out, and please keep coming to see us at the Western Wake Farmers’ Market!